R. David Lankes, A.K.A. author of the recently-released The Boring Patient, is a very dangerous man. In everything he does, he casts out his line. Hooks us. Slowly reels us in without at all making us aware of what he’s doing while he is doing it. And then he does what he always does so well: he makes us learn in ways that transform the way we see the world we all inhabit. He is, in other words, the consummate scholar, speaker, writer, teacher, storyteller, library advocate, and so much more. But above all, he’s the sort of character Anne Lamott describes in Bird by Bird, her wonderful book about writing and the creative process: the type of character we would follow anywhere—even to the county dump. Or, in The Boring Patient, to doctors’ offices, hospitals, cancer treatment centers, and, at one point, to Disney World. From beginning to end, this brief (138-page) book is a finely-crafted story that displays humor in deep moments of despair without in any way diminishing the seriousness of Lankes’s situation. He never loses sight of his well-honed ability to teach. He occasionally does (very effectively) preach—as is the case in the first sections of the book, when he addresses poignant yet no-holds-barred letters addressed “Dear Doctors,” “Dear Medical Students,” “Dear Heroic Noble Inspiring Cancer Survivor,” and “Dear Everyone Else” in a way that makes us want to buy multiple copies of the book and send them to every doctor and medical student we know. 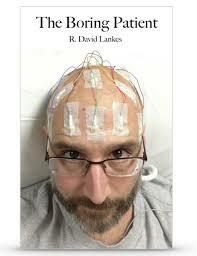 He invokes his wonderfully wicked sense of humor to recall how he and his wife had to comfort others who were finding it very difficult to deal with the life-threatening situations Lankes so often faced in spite of having been assured that those with Hodgkin’s had an extremely high recovery rate. And he continually finds ways to inspire us to find the reserves of emotional strength he found within himself through the support of his family, friends, and colleagues. The cast of characters is far-reaching and well-drawn. We meet “The Bringer of Doom,” an oncology fellow so lacking in social skills that she coldly tells Lankes and his wife that he has Hodgkin’s, then immediately separates the couple so she can whisk him away for a bone marrow biopsy “as the lab was about to close.” The Bringer resurfaces much later in the book with an equally abrupt report on the state of his health that turns out to be emotionally devastating—and completely inaccurate. There are, on the other side of the spectrum of people we meet, the nurses and doctors who seem to understand that “[b]eing a good doctor means being concerned with my life, not what might end it.” Through brief, poignant passages, we meet his wife (Anne Marie) who becomes “Xena the Patient Advocate”—a reminder that the advocates in our lives are among the most valuable assets and resources we have, as anyone familiar with the American medical system knows before reading even a few pages of The Boring Patient. And we even meet Bambi the pole dancer, who accompanies him through some of the most trying phases of his treatment—but let’s not ruin the punchline here: you’ll have to read the book to learn more about Bambi. Most impressively and importantly for those of us involved in training-teaching-learning, Lankes never loses sight of the important role he plays for his readers—the role of someone who makes information (i.e., information about what he has experienced) meaningful to those of us receiving it through the book: “Doctor, professor, teacher, librarian all can no longer believe that simply pushing information at someone and if necessary fixing it later is acceptable,” he says both as someone who received plenty of information about cancer and as someone who consistently encourages and inspires us to think about the role of information providers in society. “When I learn, when I am ‘informed,’ it is more than my memory and reason you affect. It is my emotions, my needs, my image of self” (p. 111). And if we can carry that learner-centric view of what we do as information providers and facilitators of learning, we will have emerged from our journey with this not-so-boring patient the better for having joined him. This entry was posted on Friday, December 12th, 2014 at 7:10 pm and is filed under writing. You can follow any responses to this entry through the RSS 2.0 feed. You can leave a response, or trackback from your own site.